The swivel bath/shower chair is the perfect bathroom aid for individuals with decreased and/or painful mobility challenges. It is the only compact bath chair designed to eliminate both Falls and skin tears. In addition, the swivel eliminates the need for dangerous tub entries caused by Stepping in and over the side of the tub. 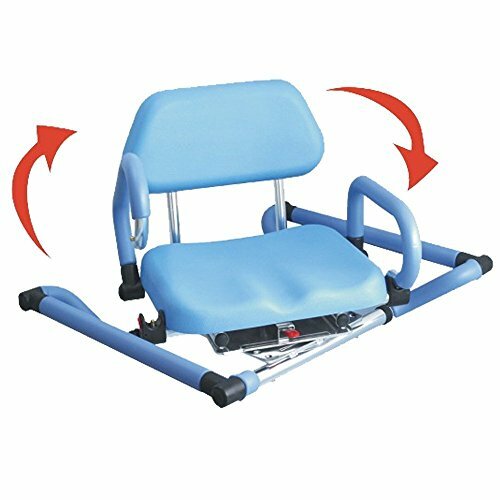 The Bather simply sits on the chair (with their feet outside of the tub) then effortlessly rotate their entire body on the swivel seat and swing their legs over the edge of the tub-all from a safe seated position. The swivel is the only bath chair that incorporates padded seat base, pivoting armrests and backrest for the ultimate in safety and comfort. Unlike bulky sliding bath benches that take up valuable bathroom floor space outside of the tub, safe swivel fits within the dimensions of the tub and does not obstruct any other bathroom functions or inconvenience other bathroom users who do not require use of the device. Designed by front-line healthcare workers with decades of experience in safe bathing and transfers, the swivel is considered the best-in-class bath/shower chair product by nurses, physiotherapists and doctors across the country.